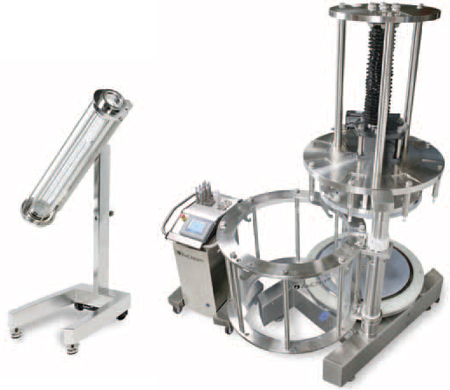 The AxiChrom™ column platform is a revolutionary concept in column chromatography that simplifies column handling at all scales from process development to full-scale production. AxiChrom columns introduce three key features – Intelligent Packing, Intuitive handling, and Predictable scale-up – that together make process chromatography easier, safer, and more efficient. Intelligent Packing: Verified, preprogrammed, axial compression packing methods save time and ensure accurate and reproducible packing results. This built-in experience reduces operator- dependence and facilitates faster product change-over. Intuitive handling: Columns are simple to operate and service. Pivot or swing-out column tubes are safer and easier to handle. AxiChrom Master and UNICORN™ wizards guide users through key process steps to save time in method creation, set-up and maintenance. Predictable scale-up: Straightforward scale-up and techtransfer due to a liquid distribution system designed using the same analytical and computational fluid dynamic (CFD) modeling tools. Sanitizable columns support cleaning validation. Full technical and regulatory support promote fast, trouble-free start-up. The entire AxiChrom column line, from 50 to 1000 mm, has been verified to give superior performance with newgeneration, high-flow Capto™ and MabSelect™ media families as well as with other BioProcess™ Media.